I was with my father the first time I saw him. I was fourteen years old and father had begun taking me into the fields with him to watch the flock. I am a shepherd by inheritance, you see. Where we lived in Bethlehem, sheep were quite valuable for their wool. Our sheep, however, were bred and raised for another purpose. Our flock was Passover stock. We bred sheep to produce unblemished lambs that were sold for sacrifice each year. During Passover in Jerusalem, an unblemished lamb brought a price five or six times its normal market value. Why, a shepherd with good stock could nearly earn his entire annual income there in a week. So it was for good reason that I was a shepherd in training the night the angel's sang. With other shepherds, we were gathered around the communal fire talking about a puzzling verse contained in one of the prophecies of Isaias. It was a verse which says the messiah would be led like a lamb to the slaughter. It seemed inconceivable to us that the messiah would die like one of our passover sheep -and for what purpose? And suddenly, there was with this angel, a multitude of others like him, singing the most beautiful music ever heard by human ears. They sang about glory and God, and peace for men whom He loves. And they told us another thing even more wonderful; they told us we could find this Saviour in a simple manger just outside of town. Nobody in town seemed to know anything about the birth of a baby and some time passed before we came upon the manger where he lay. At first, his father wasn't going to let us in but when we told of the angel's visit and song, he gave us welcome and motioned for us to enter the stable. An olive oil lamp was the only light in the place but by its flickering, we saw the child. When the angel said he'd been born in a manger I thought it a strange place for the messiah. The stable was plain, as were the garments of his parents. The babe was wrapped in an old blanket and there were farm animals about. He was alert, wide-eyed and blinking. His little hands jerked and grasped spasmodically, the way infants do. In one hand he clutched a long piece of straw but as I gazed through the half-light and shadows of that place, somehow the straw appeared to me as a scepter and the manger became the throne room of a king. Overcome, I knelt, and worshiped him there. The memory of that night and those tiny hands has stayed with me for more than thirty years now. I have come to understand that those hands in the stable were the reaching hands of God. But let me tell you more about them so you might understand as well. A few months after that wonderful night our family got word that my father's parents in Nazareth were ailing. We moved our flocks and family to that town to be with them in their final years. That is where I saw the child again. Shortly after king Herod died, I was with our flock near the edge of town beside the road that led towards Egypt. A young couple with a small boy approached along the road and at first I gave them little notice. As they drew nearer, however, I felt as though I had seen them before. I cast about in my memory for when and where it might have been. Suddenly I knew! The place had been a stable at night! These two travelers had been beside a manger-crib and this small boy had been a king. Like a man in a dream, I slowly lifted my hand in a sort of waving salute. The child waved back. Well, the couple took up housekeeping in Nazareth and soon the man had opened a modest carpentry shop. As the months and years went by, I watched the child's growth with keen interest. During his earlier years, his mother would often bring him out to the fields & meadows at the edge of town and they would have picnics. Many times while grazing my flock, I watched him from a distance, bringing flowers to his mother, climbing trees, throwing rocks, and engaging in the wonderful occupations of a child. Life seemed to overflow with exuberance from this boy. As the years passed, the child grew as much in kindness as in stature. It was a common thing in Nazareth to see him on some mission of mercy. He would bring his supper for a beggar to devour or share his lunch with a stray and hungry dog. If ever he saw other children abusing an animal, he would come to its aid and more than once, I saw rocks meant for a dog deflected by his body. On occasion in springtime, he could be seen returning a baby bird to its nest. He had a particular interest in lost creatures and loved to help shepherds search for a missing sheep. He would carry water for ladies in our town, seemingly unconcerned that it was 'women's work'. Once I even saw him carry a waterpot for a Roman girl whom the neighborhood children had been cruelly teasing. In their carpentry shop he was a great help to his father as well. Farmers stood in line for the yokes his hands had made. He was so careful in shaping and smoothing the wood that a yoke of oxen seemed hardly to notice the weight of the burdens they would bear. He worked long and hard for his father, but always in the morning and often at twilight, I would see him climbing the hills above town where he would lift his eyes and hands toward heaven. He was praying there and sometimes I had the good fortune to be near enough that his voice came across the slopes to my ears. Such prayers they were! Why, he would talk to Yahweh like you or I would talk to our father. He would go over plans, talk about the day or make requests that were quite unlike those made by the scribes or pharisees. The cycles of life and seasons continued with regularity and then one day he left our town. Most of what he did during the three or so years that followed, came to me on the lips of travelers and each new story filled my heart with wonder. I was told how the hands I had seen in a stable helped pull on the oars and nets of a Galilean fishing boat to bring in a record catch. I was told of how he would touch the bent legs of a cripple and in touching make them well. The diseased flesh of lepers deemed untouchable, he would touch and a wonderful thing would happen to them. It was said that if he touched the eyes of blind men they would see. Sickness and disease fled like night before sunrise at the touch of his hand. If ever he knocked on the door of a home where pain resided, those who lived there were sure to be surprised by joy! Once he touched the funeral bier of a mother's child and another time he took the cold hand of a sleeping maid in his. In both cases, though they were dead, yet did they live! Though it was reported that he raised a whip in the temple and overthrew the moneychanger's tables, still the same hands spread in blessing shortly after and children of the poor climbed upon his lap to feel a gentler touch. 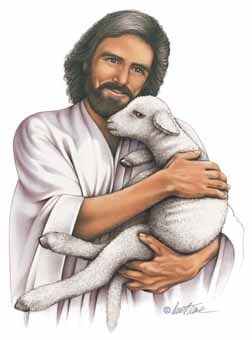 He especially loved the little children and would often hold them or pat the head of one who drew near him in a crowd. I have heard that with those hands he broke bread and fish enough to feed thousands. With those hands he lifted a fisherman named Peter from a watery grave and a woman named Mary from a living death. With one hand he pulled a cripple to his feet near the pool of Bethesda and again with one hand sent terror-stricken demons into the waters of Galilee. I wish all I had to tell was as wonderful, but one Thursday evening, in an attic room, after washing the feet of some friends, he foretold events that shame me to re-tell. In his hands he held broken pieces of bread he said were as his body soon would be. He held and drank from a cup containing wine as nearly red as his blood which soon would flow. And he made a promise then, to not drink of the fruit of the vine again until he should drink it new with us in his Father's kingdom. Afterward, they exchanged that upper room for a garden where his hands clutched at clumps of grass and soil as he pled for another way. He was not given one, but an angel came to cradle his head and strengthen his hands to take the bitter cup. Then came a wicked mob that bound his hands by torchlight but not tight enough to prevent them reaching out to restore the severed ear of an enemy. They remained tied after that, however, as he was led and shoved from one farce of a trial to another. He did not lift them to protect himself from the lash, the club or the spittle of brutish men. They did to him what they would, but like the lambs I sold for sacrifice, he uttered not a word. Though he was bleeding from head and upper body wounds, still courageously he lifted the rough-hewn timbers of a heavy cross whose splinters pierced his hands. After dragging it only a short distance, he stumbled in exhaustion upon hard cobblestones, but he struggled to rise again, after wiping the blood from his eyes. I had come to Jerusalem because of Passover and to sell my lambs. We were grazing a flock on a hill overlooking the city when the size and roar of a crowd near the western gate attracted my attention. Intending to find out the reason for such commotion, I left the flock with my herdsman and reached the crowd's edge just in time to see them nail him to the cross. His hands jerked and twitched spasmodically and suddenly I recalled an infant's hand by lamplight the night the angels sang. Where were they now? I wondered. He did too, for with a voice that seemed to ring across creation, he cried, 'My God, my God! Why have You forsaken me?' An earthquake was his only answer, then silence and a distant moaning wind. They lowered him from the cross and folded his hands in death upon his chest. He was buried in a borrowed tomb but did not stay there long! Two days later, as the sun rose, with his hands he folded the grave clothes and stepped out into glory. The scars remain, however, for two in Emmaeus saw them as he blessed their food. He still employs those hands in deeds of kindness for I am told that one morning, shortly thereafter, he prepared a fire and breakfast for some friends at the lake. He left us from a mountain top and I was among those who saw him go. He said, 'I am with you always, even unto the end of the world.' Then he lifted his hands in blessing and began to rise as though some unearthly power was attracting him to a better place. Just before he was lost in cloud, like a man in a dream, I slowly lifted my hand in a sort of waving salute. He waved back. I thought I saw seven stars in his hand but it may have only been reflected light. I raise sheep for wool now. Sacrifices are not needed anymore. Before he left he said he was going to the Father, his and ours. Stephen said he saw him standing at the right hand of God, but it seems to me that he is the right hand of God and I am thankful that he lived and moved for a time among us!